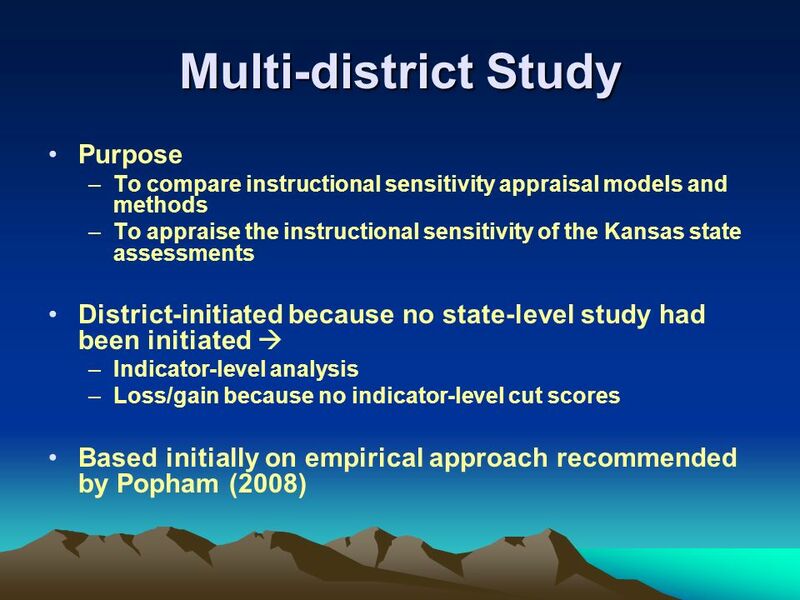 A District-initiated Appraisal of a State Assessments Instructional Sensitivity HOLDING ACCOUNTABILITY TESTS ACCOUNTABLE Stephen C. Court Presented in. 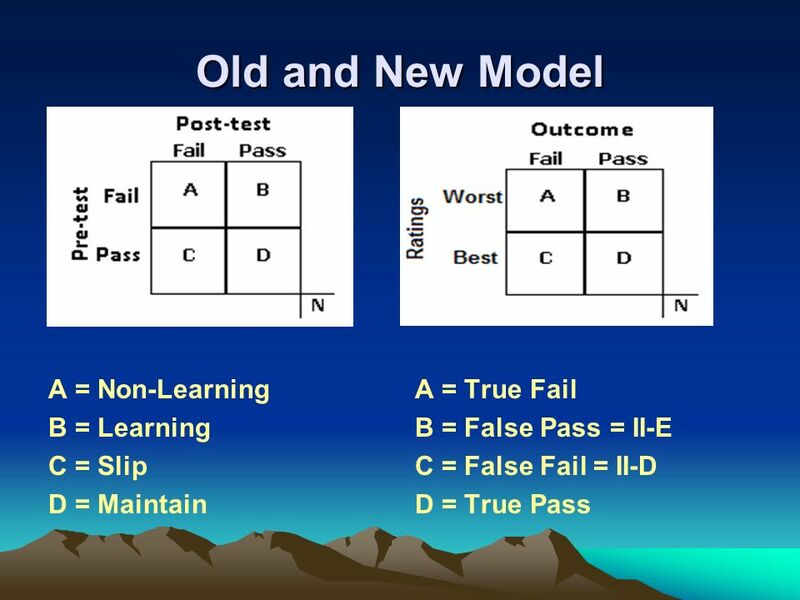 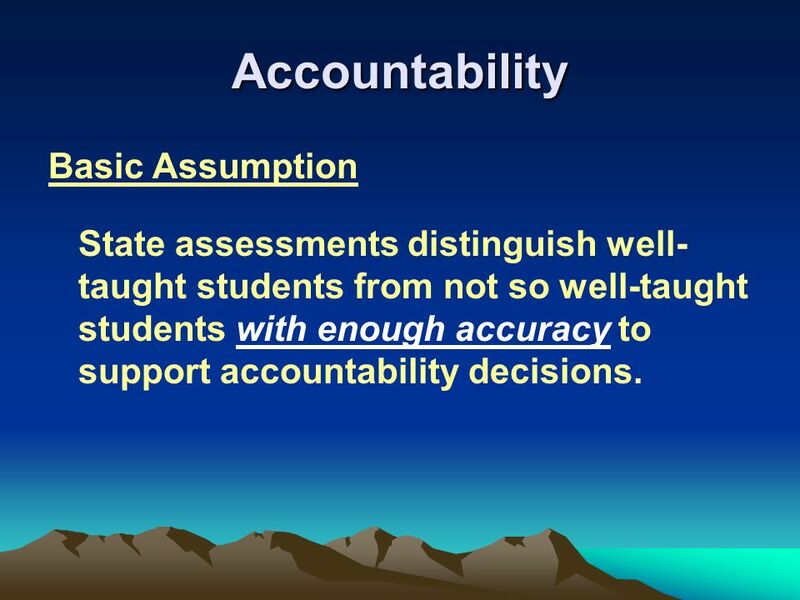 3 Accountability Basic Assumption State assessments distinguish well- taught students from not so well-taught students with enough accuracy to support accountability decisions. 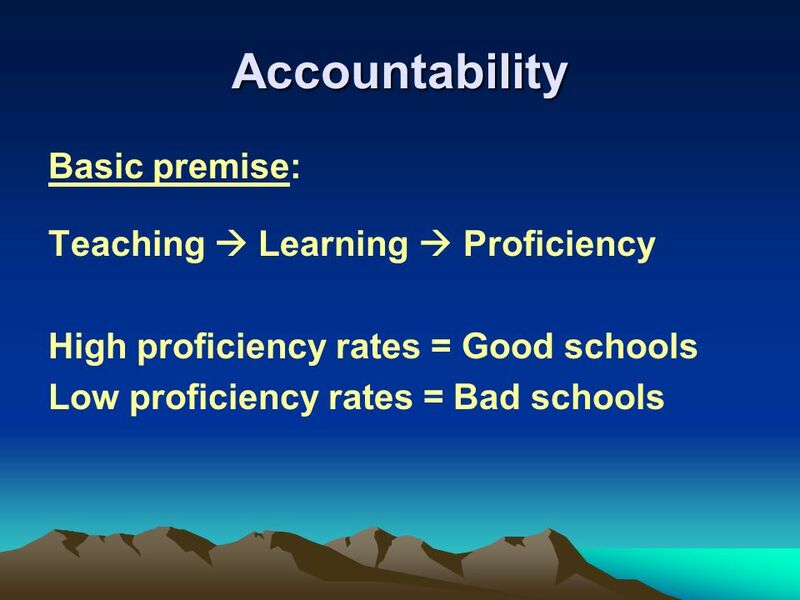 4 Accountability Q: Is the assumption warranted? 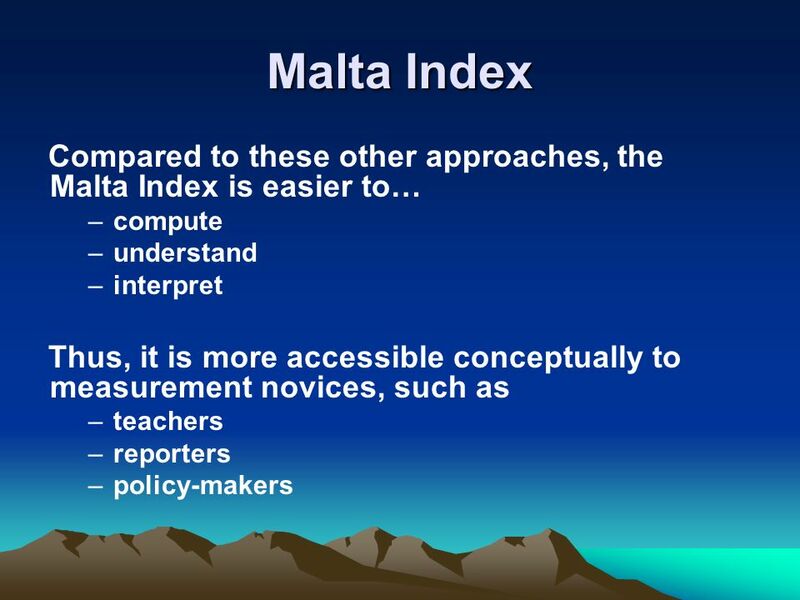 A: Only if the tests are instructionally sensitive. 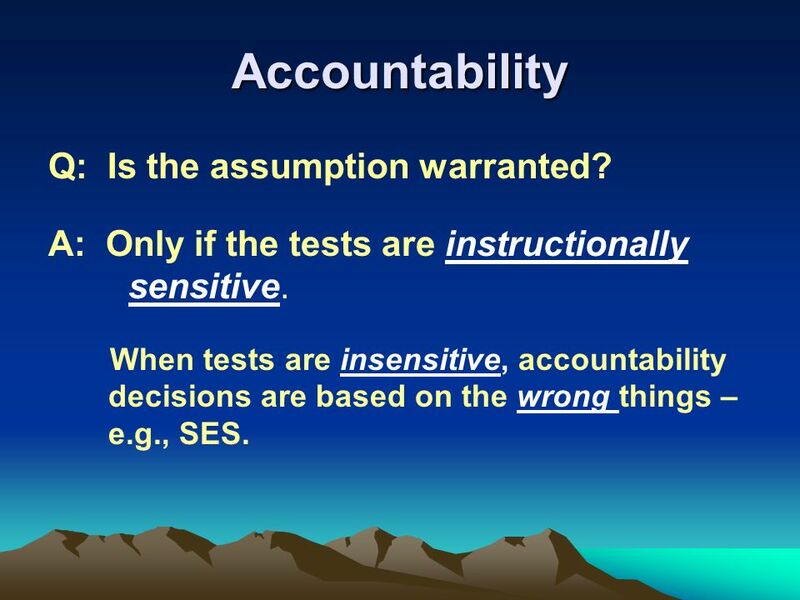 When tests are insensitive, accountability decisions are based on the wrong things – e.g., SES. 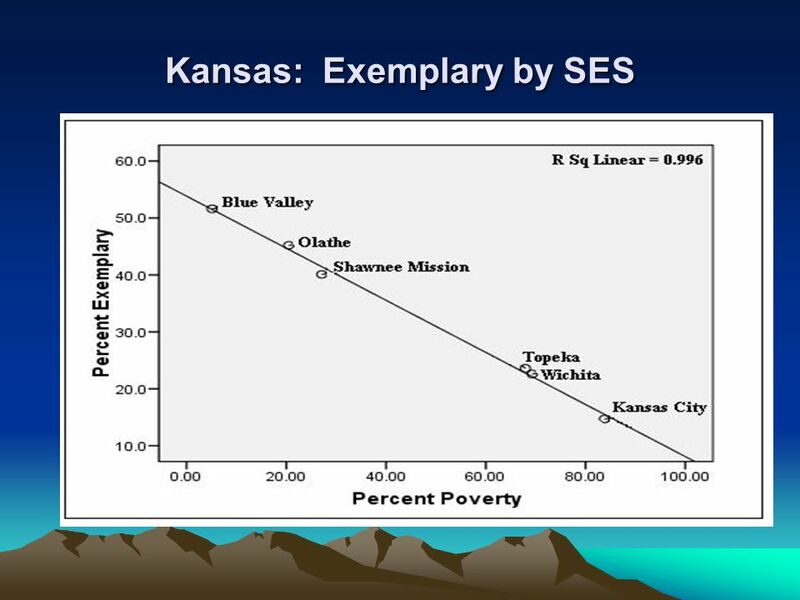 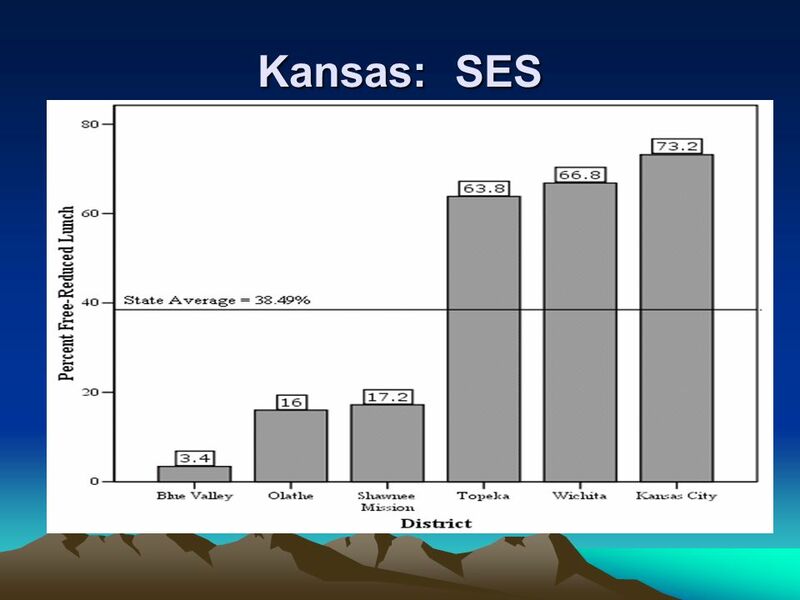 8 The Situation in Kansas Basic Question Can the instruction in low-poverty districts truly be that much better than the instruction in high-poverty districts? 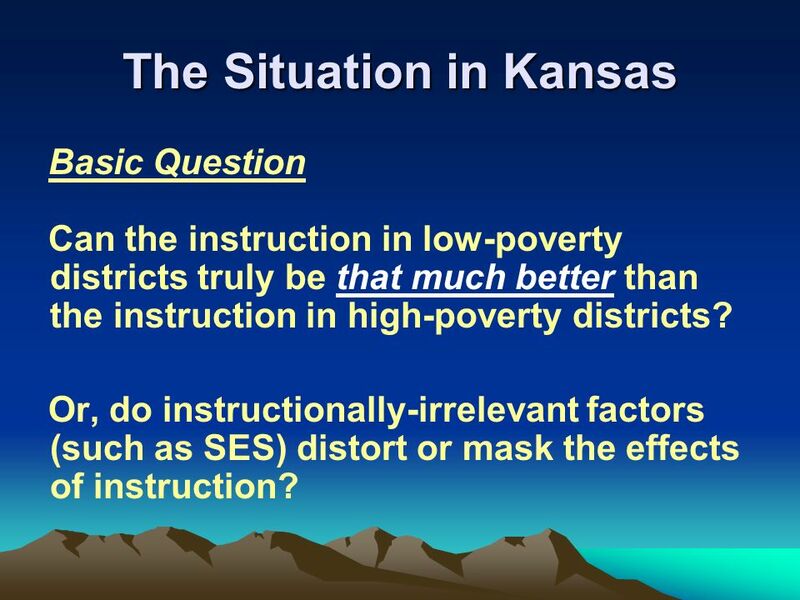 Or, do instructionally-irrelevant factors (such as SES) distort or mask the effects of instruction? 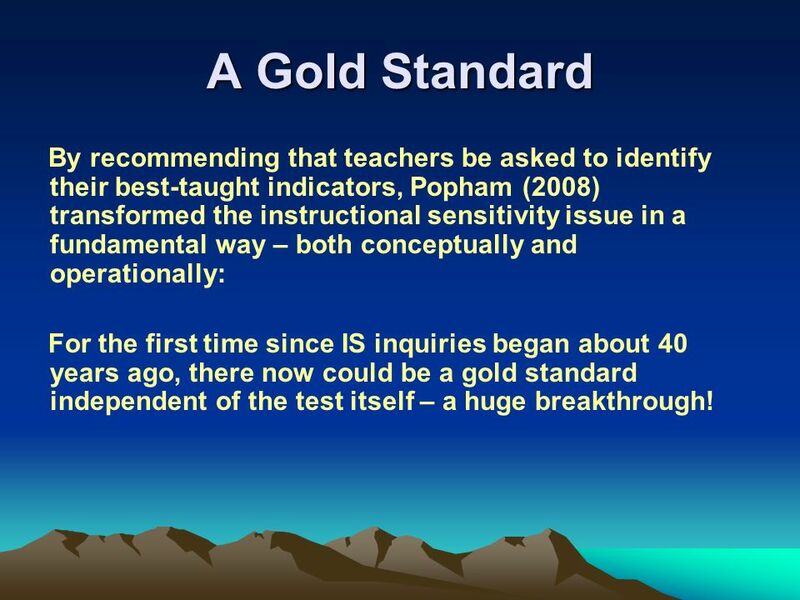 13 A Gold Standard By recommending that teachers be asked to identify their best-taught indicators, Popham (2008) transformed the instructional sensitivity issue in a fundamental way – both conceptually and operationally: For the first time since IS inquiries began about 40 years ago, there now could be a gold standard independent of the test itself – a huge breakthrough! 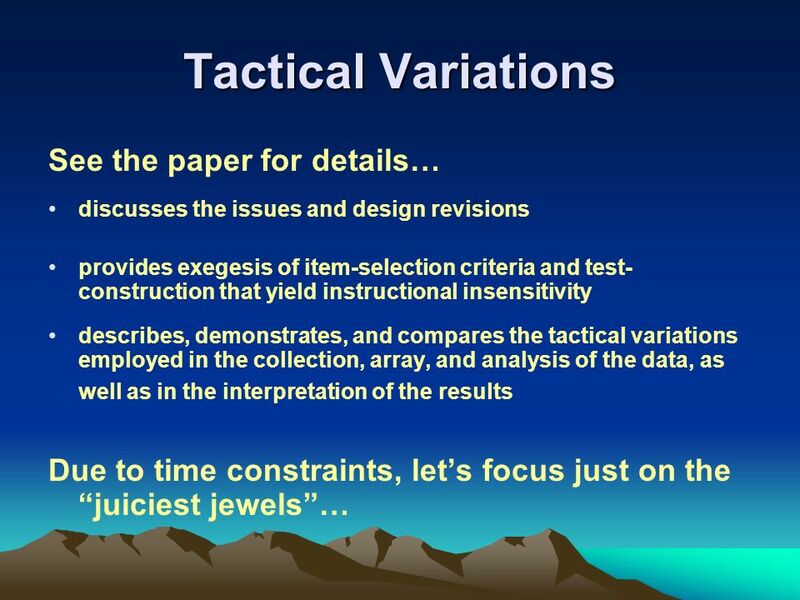 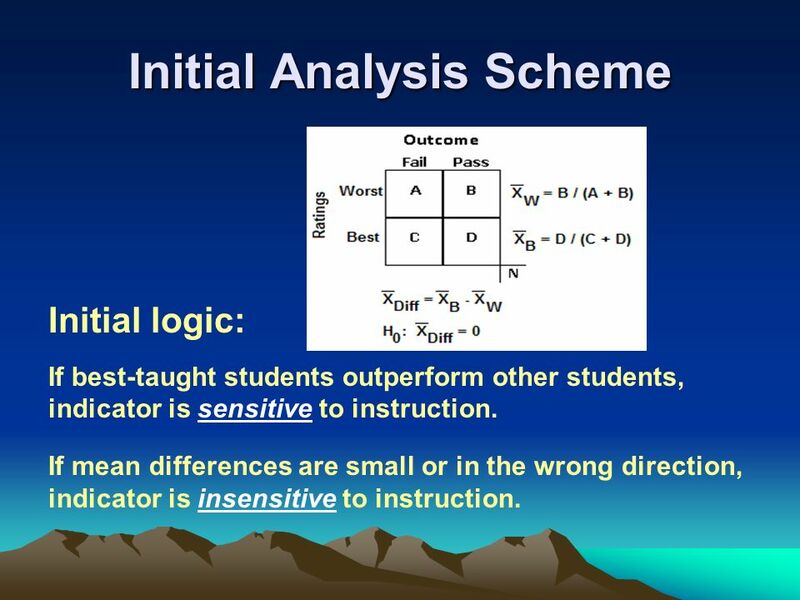 15 Initial Analysis Scheme Initial logic: If best-taught students outperform other students, indicator is sensitive to instruction. 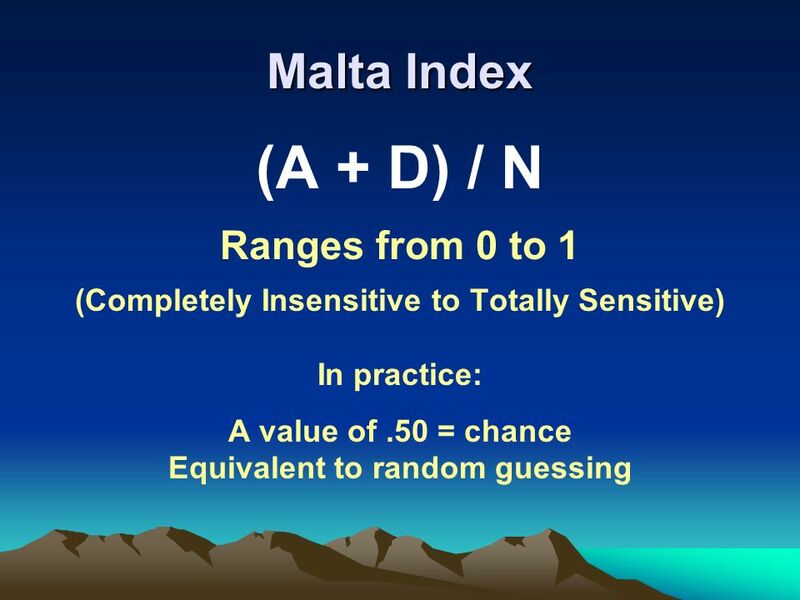 If mean differences are small or in the wrong direction, indicator is insensitive to instruction. 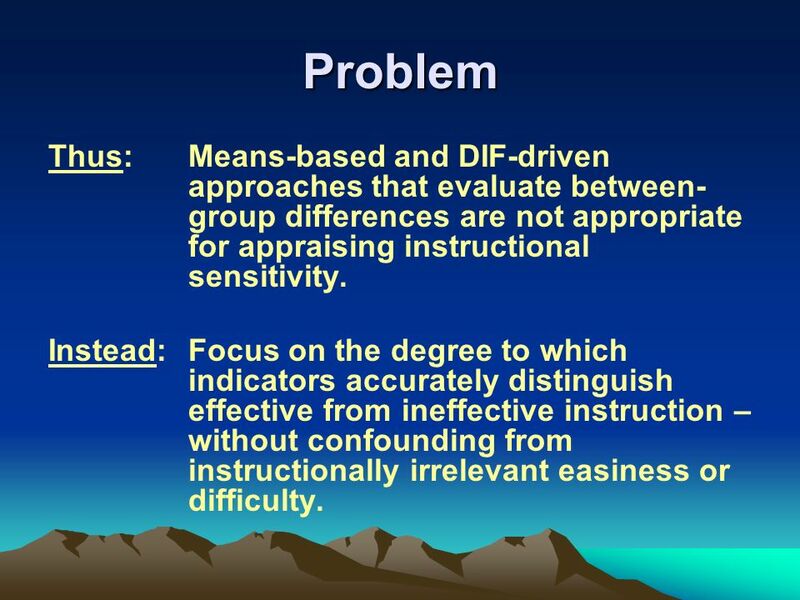 17 Problem Thus: Means-based and DIF-driven approaches that evaluate between- group differences are not appropriate for appraising instructional sensitivity. 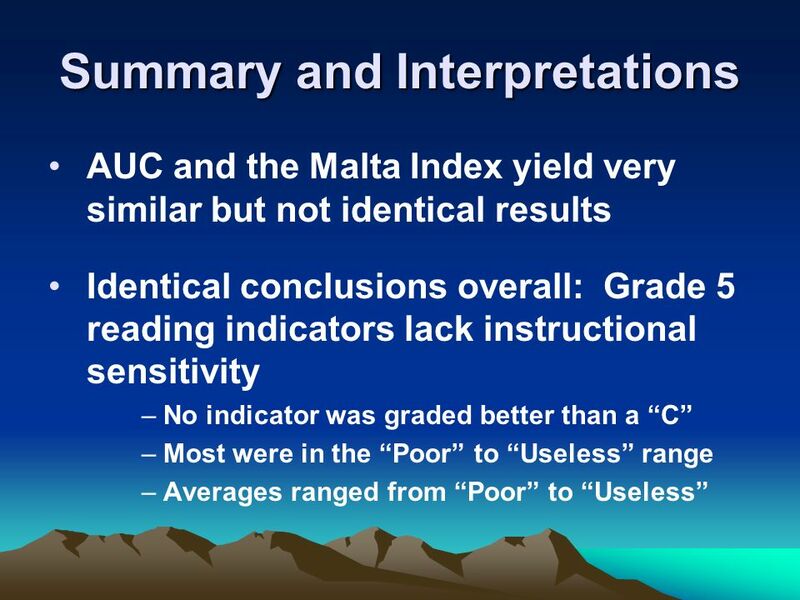 Instead: Focus on the degree to which indicators accurately distinguish effective from ineffective instruction – without confounding from instructionally irrelevant easiness or difficulty. 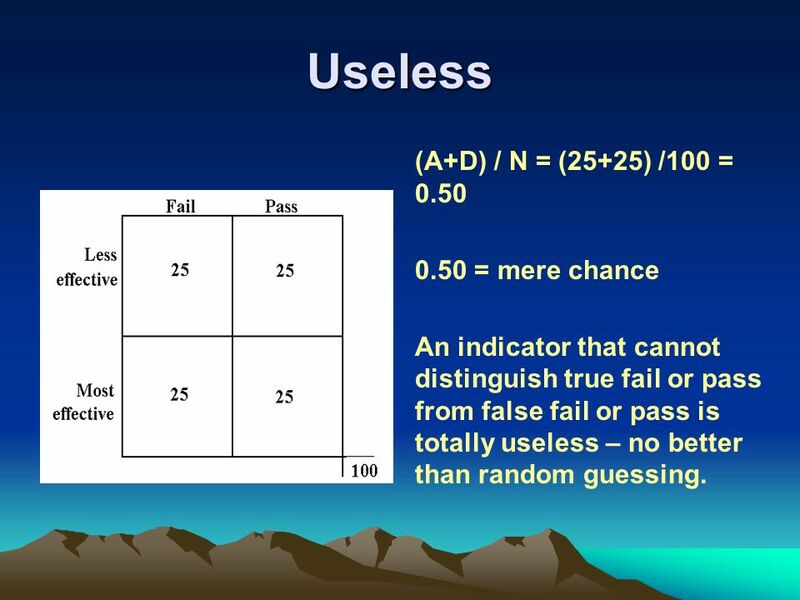 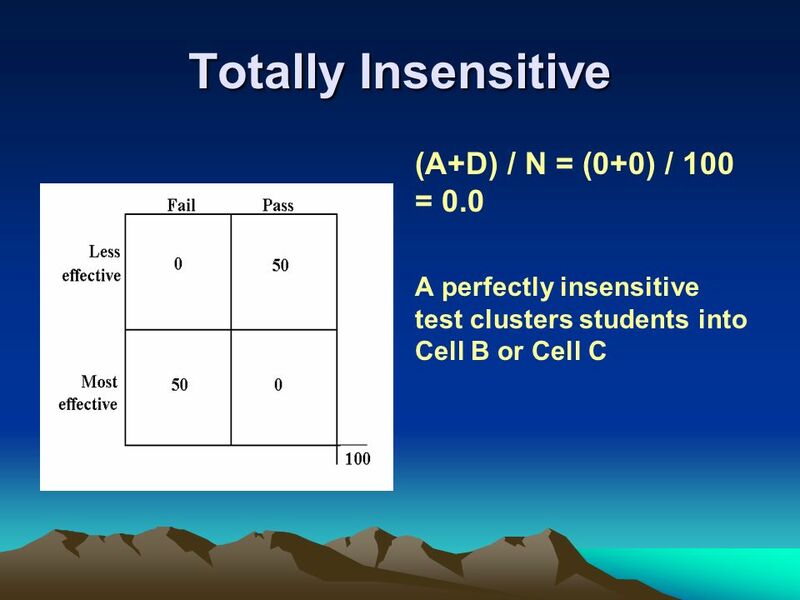 20 Totally Sensitive (A + D) / N = (50 + 50) / 100 = 1.0 A perfectly sensitive item or indicator would cluster students into Cell A or Cell D.
22 Useless (A+D) / N = (25+25) /100 = 0.50 0.50 = mere chance An indicator that cannot distinguish true fail or pass from false fail or pass is totally useless – no better than random guessing. 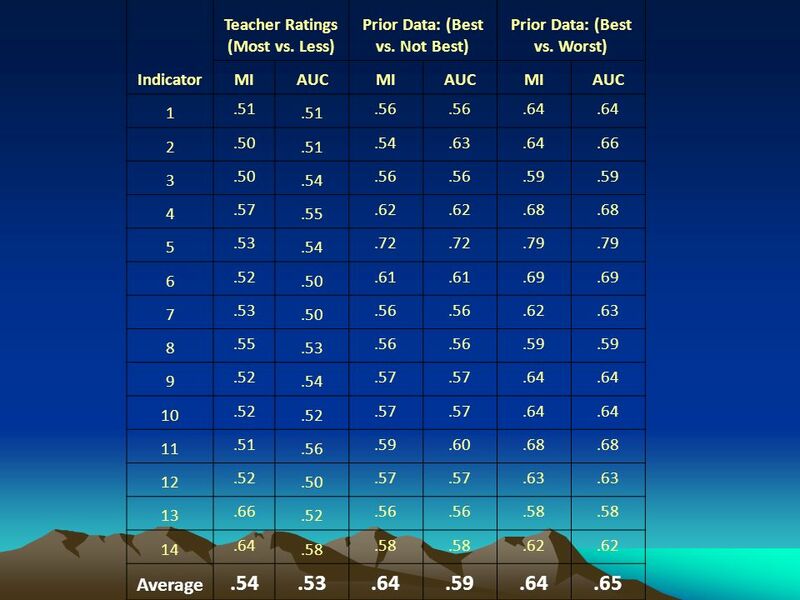 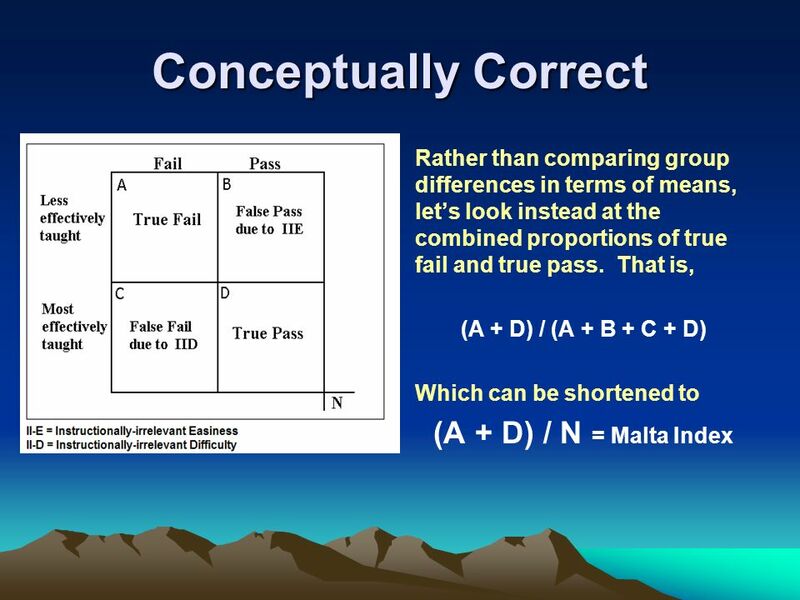 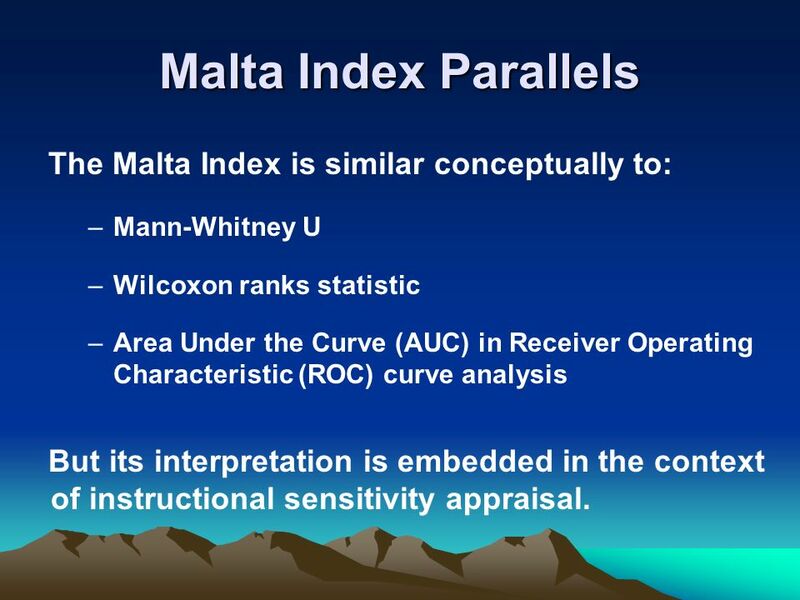 23 Malta Index Parallels The Malta Index is similar conceptually to: –Mann-Whitney U –Wilcoxon ranks statistic –Area Under the Curve (AUC) in Receiver Operating Characteristic (ROC) curve analysis But its interpretation is embedded in the context of instructional sensitivity appraisal. 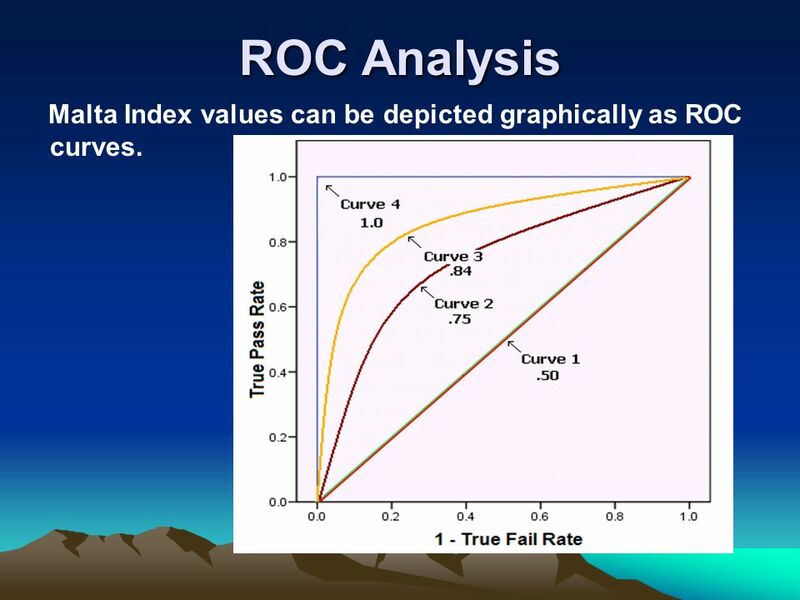 25 ROC Analysis Malta Index values can be depicted graphically as ROC curves. 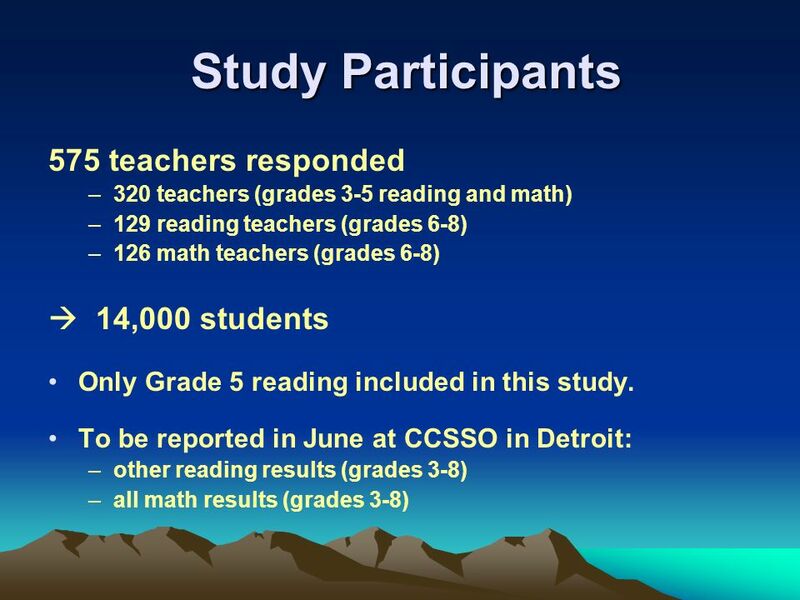 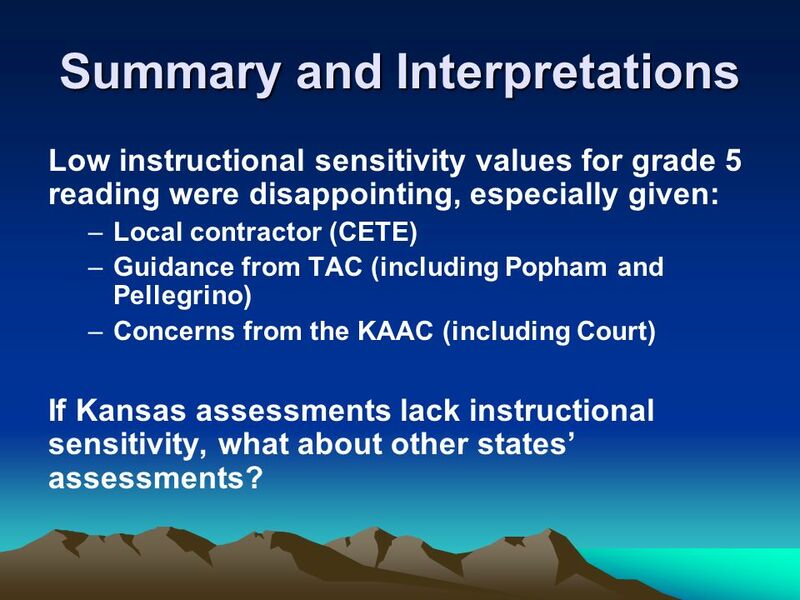 29 Summary and Interpretations Low instructional sensitivity values for grade 5 reading were disappointing, especially given: –Local contractor (CETE) –Guidance from TAC (including Popham and Pellegrino) –Concerns from the KAAC (including Court) If Kansas assessments lack instructional sensitivity, what about other states assessments? 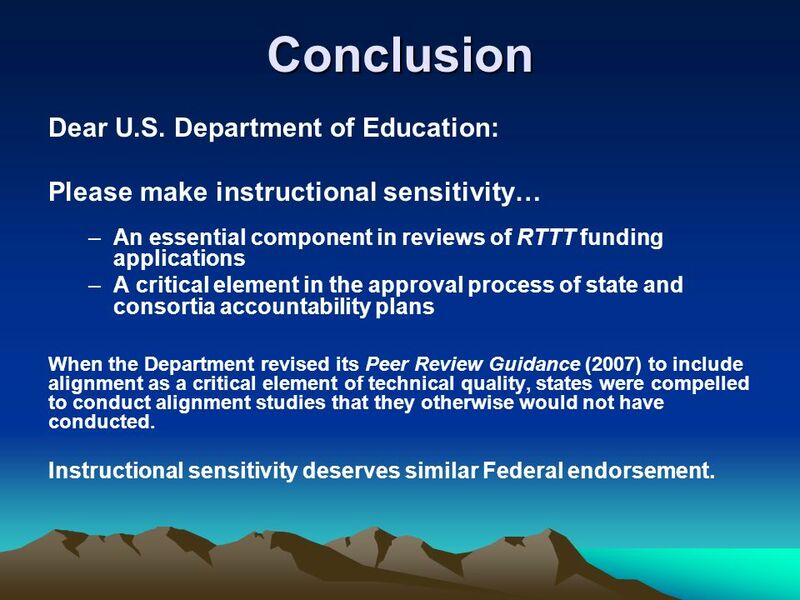 30 Conclusion Dear U.S. Department of Education: Please make instructional sensitivity… –An essential component in reviews of RTTT funding applications –A critical element in the approval process of state and consortia accountability plans When the Department revised its Peer Review Guidance (2007) to include alignment as a critical element of technical quality, states were compelled to conduct alignment studies that they otherwise would not have conducted. 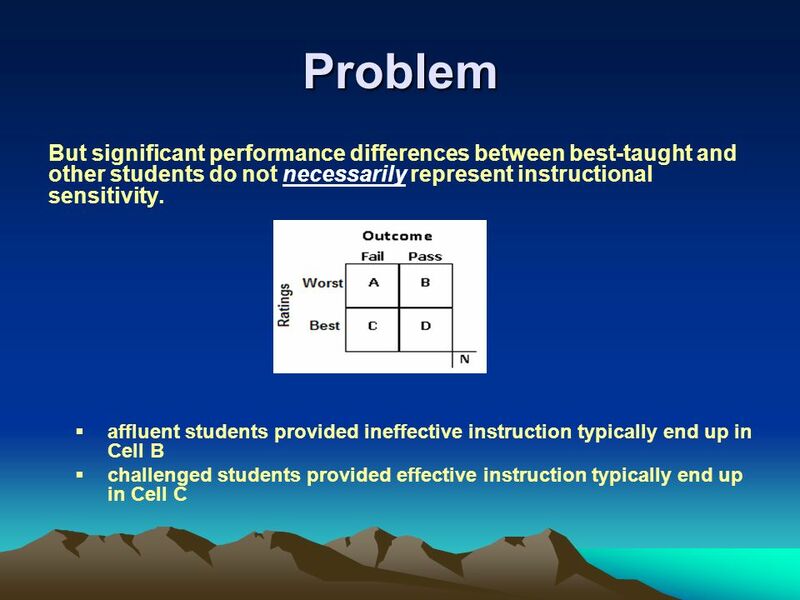 Instructional sensitivity deserves similar Federal endorsement. 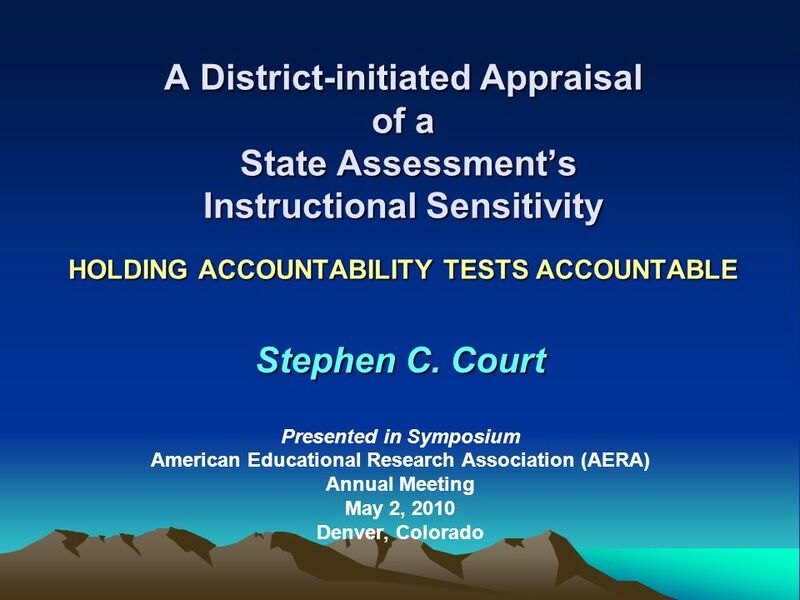 Download ppt "A District-initiated Appraisal of a State Assessments Instructional Sensitivity HOLDING ACCOUNTABILITY TESTS ACCOUNTABLE Stephen C. Court Presented in." 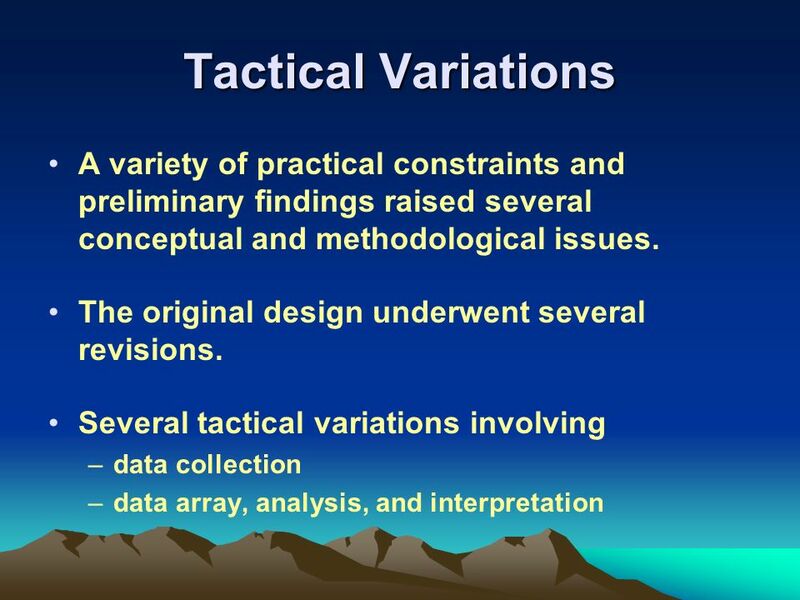 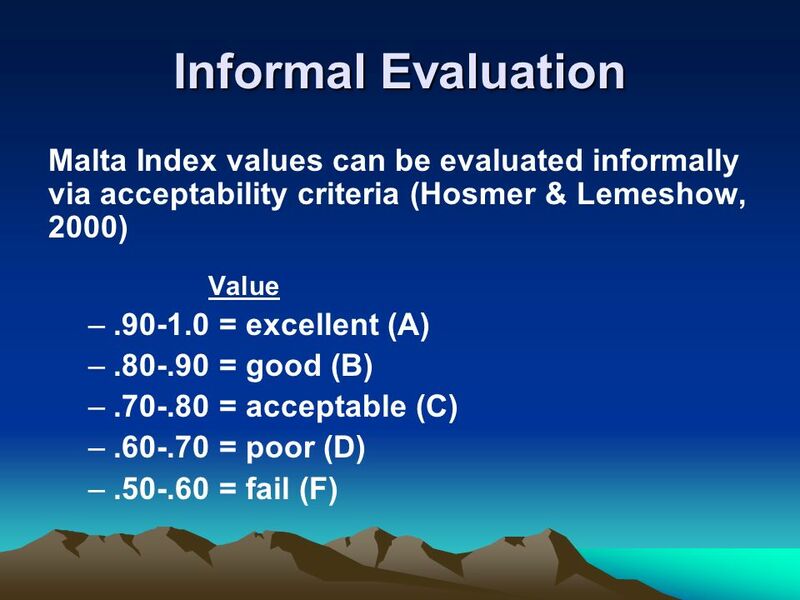 Status of Institutional Criteria and Indicators Presented by Tom Roberts Bureau of Land Management National Science and Technology Center Denver, Colorado. 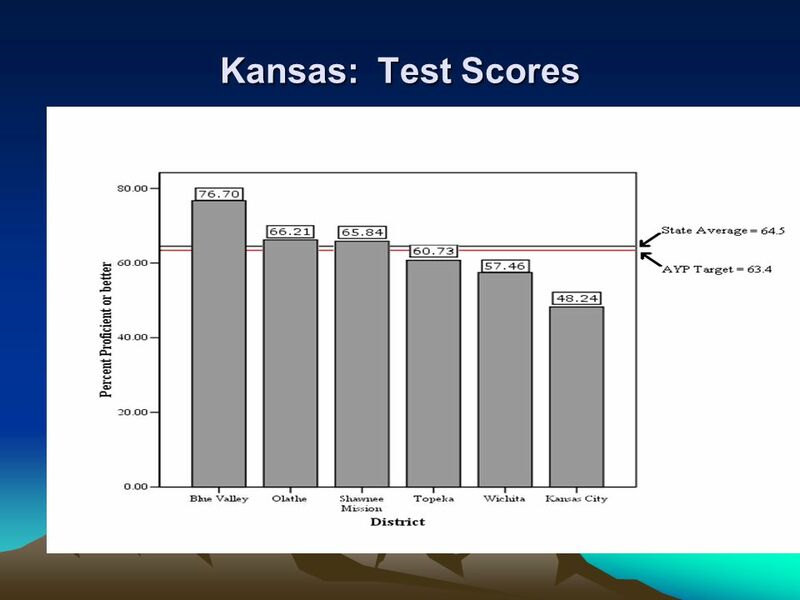 1 FAA Florida Alternate Assessment Karen Schafer Office of Testing and Accountability Brevard Public Schools. 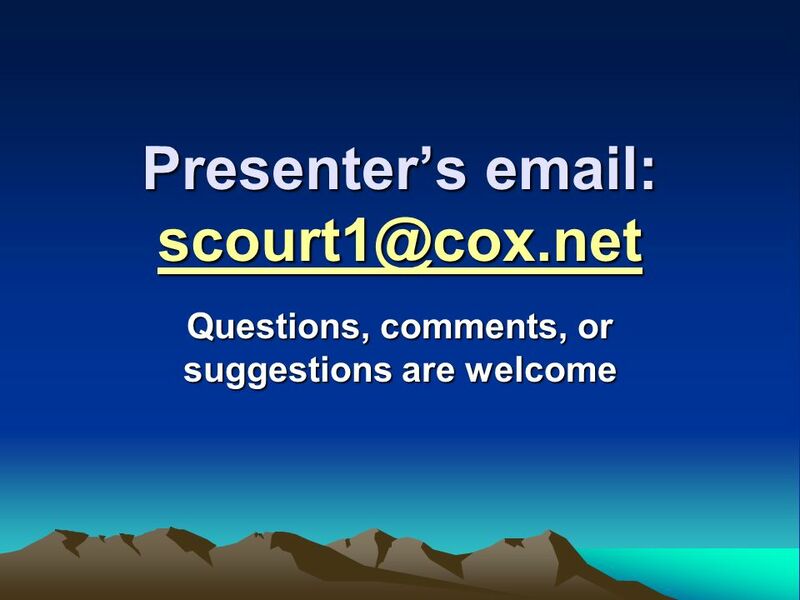 Let’s take a 15 minute break Please be back on time.